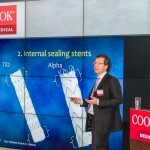 Cook Medical is a medical device manufacturer that makes 16,000 products across 13 hospital service lines. As a family-owned business, Cook Medical provides products and services to 135 countries. 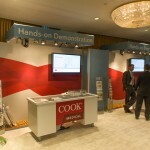 ADEX International has designed and produced Cook Medical’s booths for twenty-five plus years. 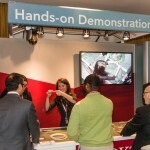 Each year at the New York Hilton, Cook Medical’s Aortic Intervention and Peripheral Intervention divisions exhibit at VEITH. The exhibit space includes two ballrooms adjacent to each other. Rendezvous is the main ballroom, while Petit is the auxiliary space. To showcase the entrance to Rendezvous, ADEX designed and produced a 35’ entryway. 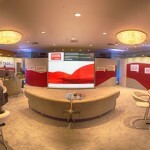 Elements included a graphic mural backdrop, pierced copy logo, backlit LED columns and a 2 x 3 video wall of 55” bezel-less LCDs. Incorporated interactive hands-on demonstrations and handcrafting stations. Each area contained an ADEX produced fabric header and backdrop. 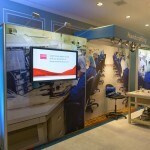 The handcrafting area contained imagery from Cook Medical’s actual production area. 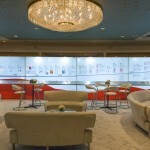 To create a more dynamic space, ADEX provided lighting elements and robotic cameras. Because the demonstrations can be intricate, the camera feeds were broadcasted locally on monitors for better viewing. 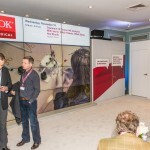 Provided 3 x 4 video wall of 55” bezel-less LCDs which displayed feeds from the general session or from the robotic cameras in demonstration areas. ADEX produced the following multimedia content to re-enforce a media driven space: real-time results from iPad questionnaires, twitter feeds, schedule of events, Cook milestones and product information. Made the space more cohesive by joining the rooms together with over 3000 square feet of carpet. 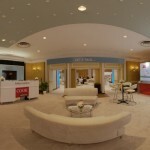 The casual and cafe seating dispersed between the two ballrooms also helped to create visual consistency. 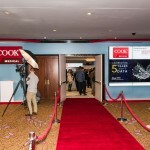 Atop the entries and exits, ADEX produced 21’ fabric headers that provided brand messaging while walking from one ballroom to the other. 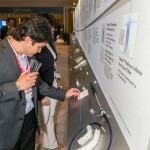 Produced a 40’ timeline and product display wall. This wall included backlit fabric graphics, product mounted on printed brush aluminum, and various plexi assemblies. Market research conducted through one-on-one customer interviews proved that the event was fascinating, unique and memorable. Significant buzz was generated internally among Cook employees, resulting in a genuine surge of pride and appreciation for our production employees. 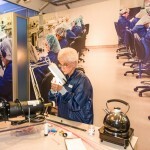 Efforts from VEITH, primarily handcrafting, are being successfully applied to various Cook customer events around the world.